Please like and subscribe to my YouTube channel. Please check out and subscribe to my Workshop Blog. I had to check the calendar. It is 2018. I wondered for a minute there. there's a lot of businesses that still use fax machines. particularly for us old buggers that have to get documents back and forth to doctors offices and medical insurance. I am too painfully aware that it's still in use. I run a small phone company. Many years ago we decided not to support fax on our network, since obviously it was dead and nobody should be using it. It serves no purpose, is wasteful, not secure, etc etc. Yeah so a few months ago I wrote the software we needed to support it, because people are STILL asking for it. Crazy. A user complained that the fax had an issue. To prove it, she sent the fax error report which the sender had scanned and e-mailed to her. Let me lay this out step by step, since I'm sure it seems like nobody is this stupid. 1. Sender puts paper in a multi-function printer (MFP) and hits fax, then dials the number. 2. Fax fails, so the MFP prints a failure report page. 3. Sender puts the printed page back into the MFP and hits scan to e-mail, then enters the address. 4. Recipient (my customer) then forwards this e-mail to me. "Why didn't you just have her e-mail the document instead???" I will certainly agree that email is radically superior to a facsimile. It's professionals like doctors and lawyers not to mention government entities that are keeping faxes alive. unfortunately I am at the stage of life in my family where we are having to deal extensively with the legal profession and health care providers thus a fax machine is almost mandatory. It should be noted that we are also talking about connecting up effectively a landline. Not exactly the most current technology. However 4 most small businesses a dedicated phone number and ability to use it are an absolute necessity even if you don't work that business full time. For example this setup is what I use 4 my home based business but I do have a mobile phone for that same business as well. 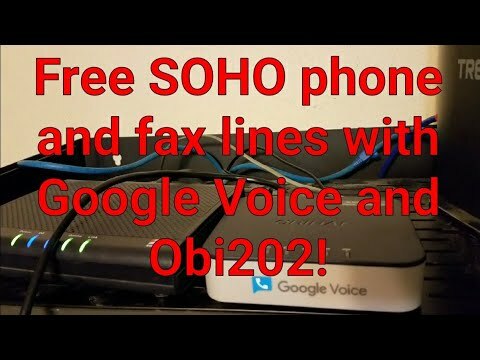 being able to have a dedicated business line voicemail and fax for no more cost then the small fee 4 the adapter and what little electricity it uses is priceless for any small business owner. Our doctors do everything by e-mail or online. I haven't sent or received a fax in over ten years, including while buying our house, and while selling a business, and starting another one. I've never run into a doctor or lawyer who prefers fax, they just find themselves having to support it because their clients want it. Unfortunately the wife has had a lot of medical needs in the last few years, and we never heard the word fax. One reason might be legality - faxed documents have been upheld in court to be valid documents, scanned and emailed documents have not, so they may not be accepted as valid. You as the buyer or seller may not have sent a fax - but the closing agents, banks, and attorneys almost certainly did. One primary concern is that email is very insecure - essentially anybody can read your email. Doctors use online systems to transmit prescriptions and medical information, they don't use email because it is not HIPAA compliant. Lawyers use faxes because it is legally safe and accepted. That's why when you need to file an FSA claim, for example, you have to go to the provider's site and upload your document to their site, or fax or mail it in. Anything that falls under HIPAA cannot be handled via email. Well, yes email "can" be insecure but it doesn't have to be. We sent legal document copies as attachments in email quite often. We also used VPN. I have forgotten the specifics but we used to send legal documents back and forth overseas. As to faxing, about once a year, I run into a company that does want a FAX. We have a FAX machine at our office but it is so old and so blocky print that I refuse to use it, but we have about one person a month that comes to "use it". I use a scanner and have a FAX app on my computer. Works fine - once a year. Several years ago I read some tech support stories. One tech support got a call from a guy who said the software on his computer would not send a fax. They did trouble shoot for about 20 minutes when the tech support guy said: "OK Lets start over. I want to know every time you twitch and move a muscle. The guy responds: Ok, I am reaching for the paper to scan, I am moving it to the monitor, I'm holding it in front of the monitor, I am pressing SEND!" Nearly all e-mail is secure. Nobody can read it while in transit (in most cases, though it's possible to force it to be unsecured). Fax is *never*secure outside of a few very expensive and rare machines (not what your doctors and lawyers use). E-mail is NOT a HIPAA violation, although some individual mail systems fail to be compliant. It's easy to have compliant e-mail though. Source: Been a network engineer for over 30 years, and currently run two tech companies. One that provides all of these services, including to the medical profession. I finished one of my HIPAA/PCI compliance tests just a few hours ago. These myths bug the **** out of me, and it's what's keeping dead tech alive, at the cost of billions of dollars of waste. Location: Paso Robles, Calif, USA. Why is fax still used for certain professions? Ignorance and laziness. Like my post above about e-mailing the fax error to me. Another user recently told me that she faxes one page at a time to her assistant, who receives the faxes as e-mail, then puts the files together in a single PDF and e-mails it back to her. The idea of pressing the "scan to PDF" or "scan to email" buttons on the machine was just too much I guess? Your vendor is an idiot. I would look at ways to distance myself from them and find a more stable source of products. One day you might just find that they are out of business because technology left them behind, or a physical building issue destroyed their files, or many other reasons that backwards companies die. I have a medical client who has faxes to certain machines so clinical workers can pick them up while under time pressure, review them with dirty gloves, and then drop the fax into the medical waste bin. "Have you considered putting screens in the actual exam rooms where they can review a file and not touch anything, and not even leave the room?" You'd think I just pulled a wiggling baby alien out of my pocket. Faxes are trivial to intercept and copy because they are the simplest form of binary data superimposed on an analog carrier (dial-up modem). You literally could record a fax on a tape and play it back to a machine to reproduce it. The idea that people would assume it to be somehow secure simply baffles me. Meanwhile, e-mails are normally encrypted the second they leave your computer and decrypted only when the other side gets it. Someone could capture the data, but not look into it. Same encryption used to protect your bank account access info while in transit. Nearly all e-mail is secure. Unfortunately it's not possible to secure email, the lack of security is inherent in the technology and protocols. Too much to explain here, but there are historical reasons for this, and we are largely stuck with the infrastructure that was defined in the 1970's. Technically email can be encrypted, but encryption is not secure either, so it still results in unsecure transmission. Faxes are arguably easier to decode, if you can get access to the signal, but they are transmitted over the physical phone system or possibly the cell network, both of which have much higher security as well as legal consequences for interception. That's one reason FSA processors won't accept a fax from an email to fax provider, for example. Even though email is essentially unsecure, in spite of the myth of "security", it's really the legal precedent that drives this. Unless and until enough proceedings establish case law to get emails accepted as legal documents and "fact", and unless and until HIPAA laws changes to allow emails, faxes will continue to be required. Last edited by woodturner; 06-04-2018, 06:53 AM. All times are GMT-5. This page was generated at 08:44 AM.